30 June 2017 Suddenly it's the July issue of Ansible (a day early for reasons too tedious for the puny human intellect to comprehend), with the usual departments and, yet again, announcements of still more additions to the TAFF Free Ebooks page. 8 June 2017 Brother Jon asks me to post this vital cultural document. Click on it to see the full-size image; there's more information online at www.mekonville.co.uk. 2 June 2017 Every time I release an ebook there's a storm of two or three complaints, usually from the same people, deploring these new-fangled electrons and asking for a print edition. Which would mean a great deal more work (especially for the new Short Shrift: A Big Book of Little Reviews with its vast size and need for multiple indexes, which are a huge pain to recreate for a POD document). If only fifty or a hundred people were clamouring in earnest for a "real book", that would sway me; but last time I catered for the usual two or three, the resulting two or three – all right, half a dozen – sales emphatically did not justify the time and effort.  Much of the Langford backlist that I've been reissuing in ebook form is still available in print, as listed with links on this page. While checking those links I found that one edition has acquired a wholly unfamiliar blurb: This new collection of essays, commissioned from a range of scholars across the world, takes as its theme the reception of Rome's greatest poet in a time of profound cultural change. Amid the rise of Christianity, the changing status of the city of Rome, and the emergence of new governing classes, Vergil remained a bedrock of Roman education and identity. This volume considers the different ways in which Vergil was read, understood and appropriated; by poets, commentators, Church fathers, orators and historians. The introduction outlines the cultural and historical contexts. Twelve chapters dedicated to individual writers or genres, and the contributors make use of a wide range of approaches from contemporary reception theory. An epilogue concludes the volume.  What a scholar I was in those days! I mean, what a range of scholars. Now I feel the urge to daringly conclude a volume with an epilogue. 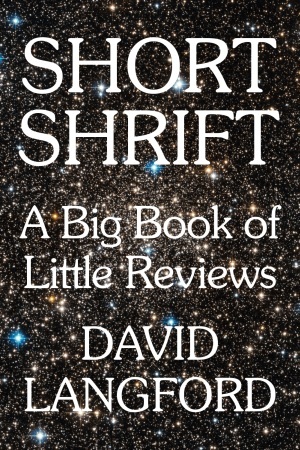 1 June 2017 It's publication day for Ansible 359, which in turn announces the release of Short Shrift: A Big Book of Little Reviews and several of those planned additions to the TAFF Free Ebooks page (see previous post). 2 May 2017 Here, as predicted yesterday by means of lengthy and complex algorithmic computations, is Ansible 358. 1 May 2017 I don't mind working on UK bank holidays but the Ansible printers think differently; so I hope to publish the May issue tomorrow. Meanwhile, let it be known that Rob Hansen's THEN has just won the 2017 Fanzine Activity Achievement Award in the category of Best Special Issue. Congratulations, Rob! 28 April 2017 Paul Barnett sends the link to a 2001 review of The Leaky Establishment that I missed when it first appeared. 14 April 2017 Now I'm off to Birmingham for the UK national Eastercon, which this year is nameless and thus called Innominate. Here's the programme schedule page. 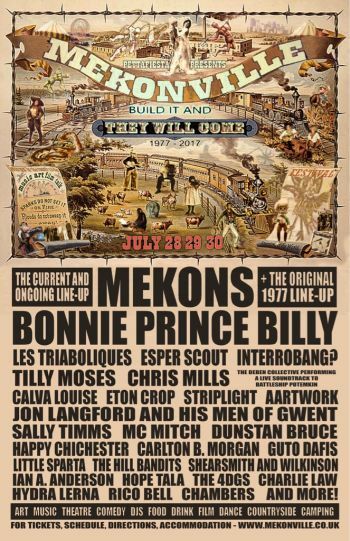 I make only two official appearances: at the NewCon Press launch, 6:30-7:30pm Friday (today) and, representing Rob Hansen of THEN fame, the BSFA Awards ceremony (5:30-7pm Saturday) [alas, Rob didn't win but we all love Geoff Ryman, who did].  Meanwhile, here's a politically inflammatory cartoon from the traditional Judy Horacek birthday card sent to me by Yvonne Rousseau. 30 March 2017 A little earlier than expected, here's Ansible 357. Also earlier than expected was my first fan letter (and a very nice one too) on All Good Things: The Last SFX Visions. Although this isn't officially published until 21 April, NewCon Press is already filling orders for the trade paperback edition. The limited-edition hardbacks will have to wait until I've signed them all at Eastercon. 14 March 2017 Time to book my rail ticket to the UK Eastercon. The NewCon Press book launch for All Good Things: The Last SFX Visions is currently expected to be at 5pm 6:30pm on Good Friday. I'm also Rob Hansen's official representative at the BSFA Awards, where his THEN: Science Fiction Fandom in the UK: 1930-1980 is a nonfiction finalist. There are no plans for an Ansible Editions table in the dealers' room, but if anyone wants a printed copy of Then I could bring a small number for sale at the special Novacon prices: £16 trade paperback, £24 hardback. Please let me know by email if you'd like one. 1 March 2017 Happy St David's Day. Also, here's Ansible 356. 27 February 2017 My promised nonfiction collection All Good Things: The Last SFX Visions, officially published by NewCon Press/Steel Quill on 21 April 2017, will indeed be launched at Eastercon and is already available for pre-order at the NewCon Press website. The cover is by regular column illustrator Andy Watt, from the SFX 250 instalment, and many more of Andy's cartoons are to be reprinted in the book. Besides the trade paperback with black-and-white interior art, there is to be a super luxury hardback with the illustrations in full colour. 19 February 2017 The BSFA Awards shortlist has been released and (wearing my Ansible Editions hat) I am of course delighted that Rob Hansen's THEN: Science Fiction Fandom in the UK: 1930-1980 appears in the nonfiction category. 17 February 2017 My final collection of Langford columns from SFX magazine is to be launched at Eastercon as a title in the Steel Quill nonfiction imprint of Ian Whates's NewCon Press. Besides the 2009-2016 columns it contains reviews and criticism published elsewhere in the same period, bringing the total to 100 pieces plus a new introduction. 1 February 2017 Despite being so short, February is a bonus month with two issues of Ansible. The usual coverage appears in Ansible 355 and – reviving the long-lost tradition of extra "half issues" – Ansible 355½ is devoted to Tom Shippey's funeral tribute to Peter Weston. 11 January 2017 January freebie at Ansible Editions: the first 48pp of Rob Hansen's history of UK fandom (including introductions and the entire 1930s section) can be downloaded without charge until the end of the month. Why, yes, this is indeed a naked attempt to influence BSFA Award voters in their choices for the nonfiction shortlist. 7 January 2017 Good news for Ansible Editions: Rob Hansen is on the longlist for the nonfiction category of the BSFA Awards with his monumental tome THEN: Science Fiction Fandom in the UK: 1930-1980. 3 January 2017 There was an unavoidable delay between first-footing and first-Ansibleing, but here at last is the January issue. 1 January 2017 Happy New Year to all. The photo shows a mystical cosmic alignment (possibly marking the architect's birthday) whereby in late December the sun briefly shines through an upstairs window, slants through the full depth of the house and lights up our front door from inside. As Erich von Däniken was wont to say, "This proves it!"